Planters' iconic mascot is getting to be a real nut-buster these days. 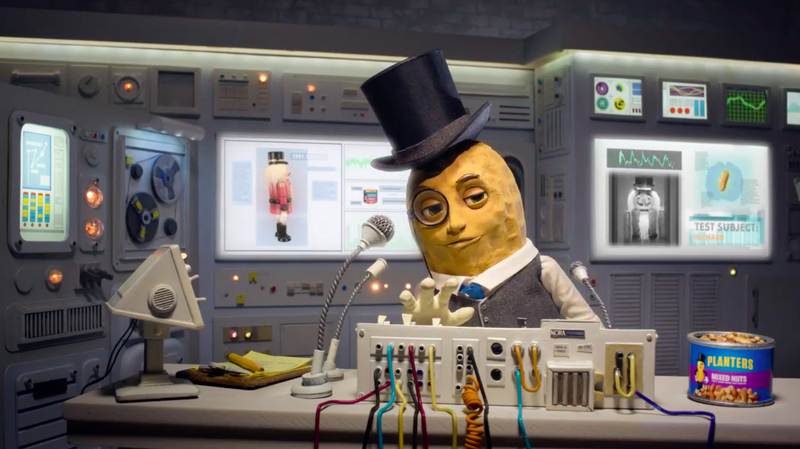 Slap on your monocle and watch how Mr. Peanut taunts his nemesis, Richard the Nutcracker, in the new ad below, sealing the dude in a glass chamber and tempting him with snacks to test Planters' "craveability." Developed by Leo Burnett, the "Irresistibly Planters" campaign rolls out on TV early next week. It focuses on taste after years of Planters ads spotlighting the nutritional attributes of peanuts. That shift "has the potential to win with our consumers when they're looking for a quick salty fix they can feel good about," Camille Vareille, head of brand building at Planters parent Kraft Heinz, tells Adweek. She dismisses suggestions that Mr. Peanut has morphed into a hard case. "He's trying to protect the Planters nuts from his friends who have an irresistible craving," she says. "We like to think he does so with the utmost class and a witty personality." Yo, P., maybe squirrels aren't the best workforce for a nut factory. Commercials break on Monday, with social and digital elements dropping next month.